Erosion is the general term for the processes that wear down Earth's surfaces, exposing the rocks below. The natural forces responsible for this endless sculpting include running water, near-shore waves, ice, wind, and gravity. The material produced by erosion is called sediment or sedimentary particles. Covering most of Earth's surface is a thin layer of sediment known as regolith, which is produced by the erosion of bedrock, or the solid rock surface underlying Earth's surface. Running water. Everywhere on the planet, running water continuously reshapes the land by carrying soil and debris steadily downslope. As the sediment and other eroded materials are carried along the bottoms of streams and rivers, they scour away the bedrock underneath, eventually carving deep gorges or openings. A classic example of the erosive power of running water over a great period of time is the Grand Canyon of the Colorado River. Rain falling on dry land also can result in erosion. When raindrops strike bare ground that is not protected by vegetation, they loosen particles of soil, spattering them in all directions. During heavy rains on sloped surfaces, the dislodged soil is carried off in a flow of water. Near-shore waves. Along seacoasts, the constant movement of tides and the pounding of waves alter the shoreline. The strong force of waves, especially during storms, erodes beaches and cliffs. Breaking waves often contain small pebbles and stones that scrape away at seacoast rocks, rubbing and grinding them into pieces. Waves can also trap air in small cracks and crevices in the rocks against which they crash. Small explosions in the rock result when air pressure builds up, sending loose chunks of rock toppling down. Ice. Ice, in the form of huge glaciers, can plow through rock, soil, and vegetation. As the ice moves along, it scoops up great chunks of bedrock from the slopes, creating deep valleys. In turn, the rocks and soil already carried along the bottom of the glacier wear away the bedrock that is not loosened. Along many seacoasts, especially in Norway, glaciers gouged out fjords—long, narrow inlets whose bottoms can reach depths thousands of feet below sea level. Wind. Wind erosion is referred to as eolian erosion, after Aeolus, the Greek god of wind. Erosion due to wind is more pronounced in dry regions and over land that lacks vegetation. The wind easily picks up particles of soil, sand, and dust and carries them away. Wind cannot carry as large of particles as flowing water, and it cannot carry fine particles more than a few feet or a meter above ground level. However, windblown grains of sand, when carried along at high speeds, effectively act as cutting tools. In desert regions, the bases of rocks and cliffs are often dramatically sandblasted away, resulting in mushroom-shaped rocks with large caps and slender stems. Gravity. Gravity exerts a force on all matter, earth materials included. Gravity, acting alone, moves sediment down slopes. Gravity also causes water and ice to flow down slopes, transporting sediment with them. When bare soil on steep slopes becomes waterlogged and fluid, the downward pull of gravity results in a landslide. Sometimes landslides are simple lobes of soil slumped down a hillside; other times they can be an avalanche of rocks and debris hurtling downslope. 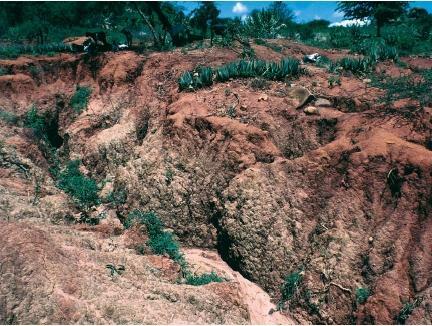 Soil loss results naturally from erosion. A balance exists on Earth between the erosion of land and its rejuvenation by natural forces. However, human activities have overwhelmed this balance in many parts of the world. The removal of vegetation, poor farming practices, strip mining, logging, construction, landscaping, and other activities all increase erosion. In general, any land use or activity that disturbs the natural vegetation or that changes the slope or surface materials of an area will increase the chances of erosion. The Dust Bowl that took place in the prairie states of America in the 1930s is an example of an ecological disaster resulting from erosion. In the years leading up to the Dust Bowl, farmers planted wheat on lands that were formerly used for livestock grazing. After several growing seasons, the livestock were returned and allowed to graze. Their hooves pulverized the unprotected soil, which strong winds then carried aloft in huge dust clouds. Crops and land were destroyed by the dust storms, and many families were forced to abandon their farms. This website was really helpful on a school project I am working on. The best knowledge for students.Thanks!This helped me alot for my project that I am working on. This information is very useful for todays generation. This website has give me the perfect amount of information! This is perfect! this website happened be on my homework:) thanks for putting amazing information for people who need help.